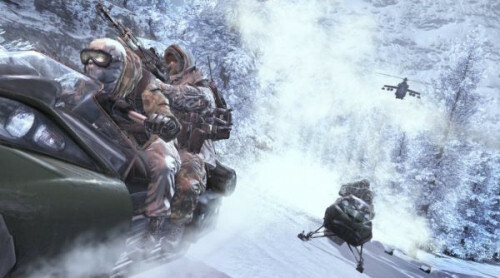 We're only a little over a month away from Call of Duty: Modern Warfare 2's release, yet we still don't know too much regarding the game's two player co-op mode called Spec-Ops. Community manager Robert Bowling decided to answer some user questions via Twitter and there's some new information leaking out regarding this mode. The first bit of information regards the mode's gameplay length. We've heard rumors that it should be a bit longer than the single player, but now we know why. According to Bowling each Spec Ops mission offers three available stars, one for each difficulty level. Bowling stated there were 69 total stars available bringing the mission count in spec ops to 23. There's nothing specific there as to the length, but Bowling stated that trying to achieve all three stars on each mission will add to the length. Another bit of news regarding the Spec Ops missions are the variety. There appears to be variety of mission types and objectives, including a "waves" mode which we assume to be like Horde and Firefight in terms of gameplay. Other details above and beyond that aren't available...yet. We'll be keeping an eye on Twitter for more information as it becomes available. Page created in 0.2928 seconds.